Download Corel MotionStudio 3D latest version free (Demo). It helps you to create custom 3D titles and 3D animation with amazing effects to your videos. It is very easy to use even for newcomer. You can add 3D graphics, particle effects, animated text, motion blur and much more. Corel MotionStudio 3D allows you to insert lathe objects, geometric objects, text, graphics with your new video production. So you can make your new videos more impressive and attractive. Thus Corel MotionStudio 3D is also a best marketing improvement tool for you. It will provide you a high speed animation and titling environment. There are also some great and wide variety of distortion effects such as bend, Freeform and twist. 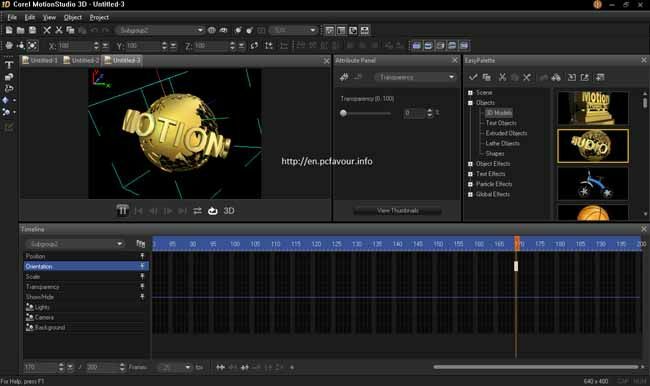 MotionStudio 3D also offers key frame able, animated explosions and blast effects for your text. There are hundreds of presets in Corel MotionStudio 3D those make it easy to use. You can apply snow, fire, bubbles, smoke and many more effects using high end particle systems. It also enables you to add realistic motion blur to make object moving or you can import any 3D model to implement. You can watch your productions in real time using preview panel. After completing your project, you can easily export it to your favorite video editing software or to flash .swf.